Come, sing a new song to God! God has already saved us! For God is not done doing wonders! God is coming to set everything right. 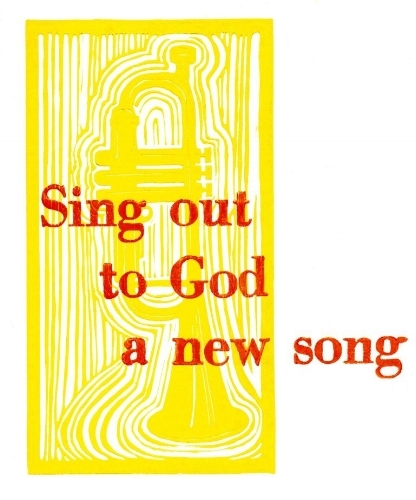 Sing a new song to God! Copyright © 2017 Breathelike Music, Pick In A Pinch Music and T C F Music Publishing, Inc.
We gather as a people so grateful for your every blessing and your streams of mercy never ceasing, yet we readily acknowledge that we are prone to wander from you. We are prone to seek our own way and to rely on ourselves more than upon you. When invited to your kingdom table, we are prone to believe we earned our place with our goodness and our faithfulness. When we gather at your table, we believe in our heart of hearts that we deserve a place of honor closest to you. Forgive us, O God. Forgive our arrogance. Forgive our false humility. Forgive us for believing even for one moment that we deserve any of your blessings and mercy. God has brought us victory! Shout of tribute to our Lord! You are invited to stay for lunch and activities as we celebrate our community! Participants in Today’s Service: Pastor: John Hilley; Music Director: Nate Strasser; Musicians: the Youth Band; Liturgist: Liz Beatty; Elder of the Day: Brian Telford. This Week in Children's Worship and UPWARDS: This sixth Sunday in Easter, children will remain downstairs. They will complete a gratitude project at their seats during the later half of the service. Older children will have the opportunity to write thank you notes to church staff and volunteers while younger children can draw a picture to present as a thank you for all the amazing youth and adults who are helping us grow into creative thinkers and doers of Christ! Independent Sector values volunteer time at for the state of TN was $21.98 in 2017. At that rate we donated the equivalent of $7,165.48 in in-kind contribution (labor)! We also wanted to give a huge shout to Ann Ketch for all of her work coordinating our EBPC efforts in this wonderful community outreach program. Thank you! Thanks for everyone that joined us at the Well this last Saturday! It was a really fun way to spend some time together and listen to great music. As we are practicing good hospitality skills, sometimes it is a good idea to imagine what it is like to visit EBPC for the first time. The Hospitality and Membership Engagement Team would like for you to take the opportunity the next time you are at EBPC to see our building, our hospitality system and worship service through new eyes. Please download this survey, note your observations from the point of view of a visitor and return your form to Liz Beatty or drop it off in the church office. Thank you for your feedback. † Prayers of thanksgiving and blessing for Alissa Vasilevskis, Susan Rohleder, Josh, Allison, Abigail, and Jacob Hockman, and Lilian, Amelia, and Ellery Edwards who were received into church membership.